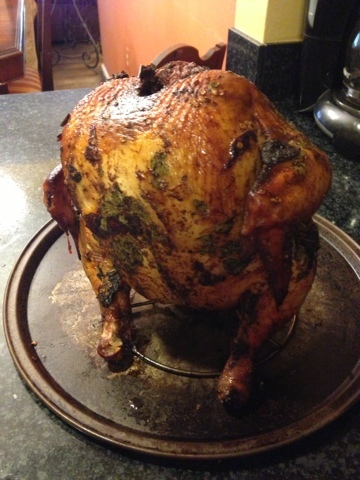 As I mentioned yesterday, we smoked a Peruvian Chicken for our Memorial Day celebration. This is one of my favorite rubs, and it is INCREDIBLY easy. The chicken comes out super super juicy with lots of flavor. I doubled the recipe for MDW because we using a much larger bird. I normally buy a 5 pound chicken for this recipe. Drain Chipotle Peppers and then coarsly chop. 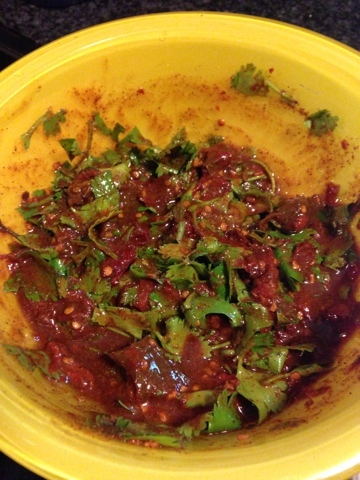 Coarsly chop cilantro. Place in a bowl. 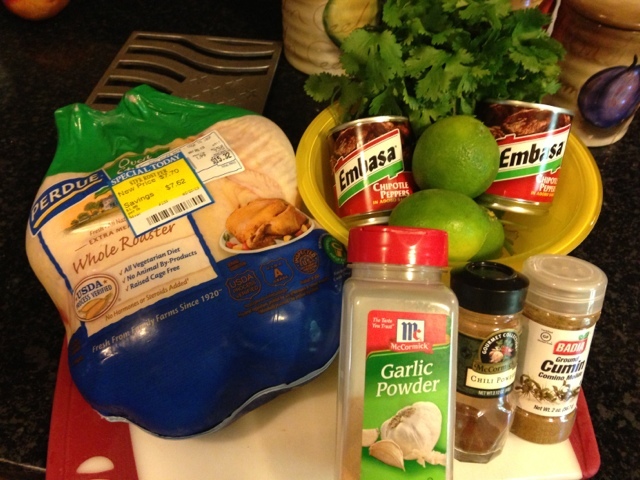 Add lime juice, garlic powder, chili powder, and cumin. Mix well. 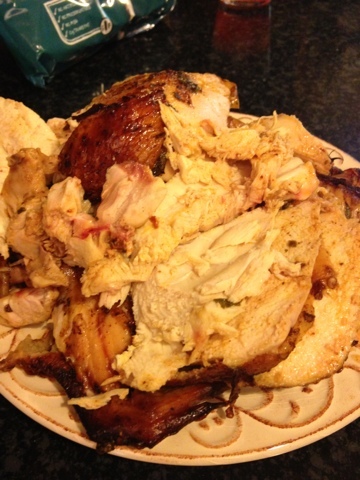 Rub the mixture all over the outside of the chicken as well as under the skin. Use all of the mixture. Wrap chicken in plastic wrap and refrigerate for up to 24 hours. 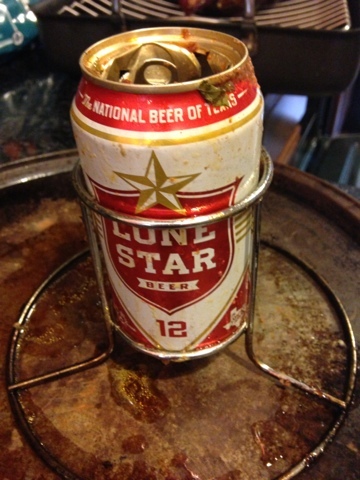 (I have cooked it immediately after coating in the rub as well, but if you can let it marinate then do it. Adds to the flavor) You can skip the plastic wrap step if you plan to cook immediately. 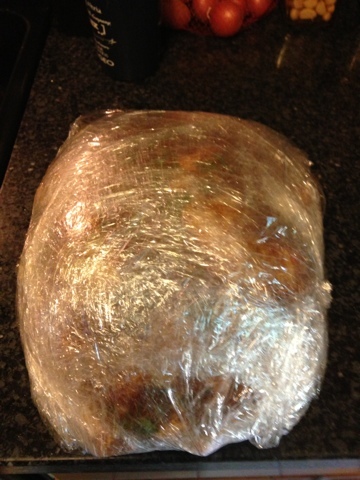 After the chicken has marinated, take chicken out of fridge and remove plastic wrap. We decided to smoke the chicken, but you can easily throw this on the grille or in the oven. 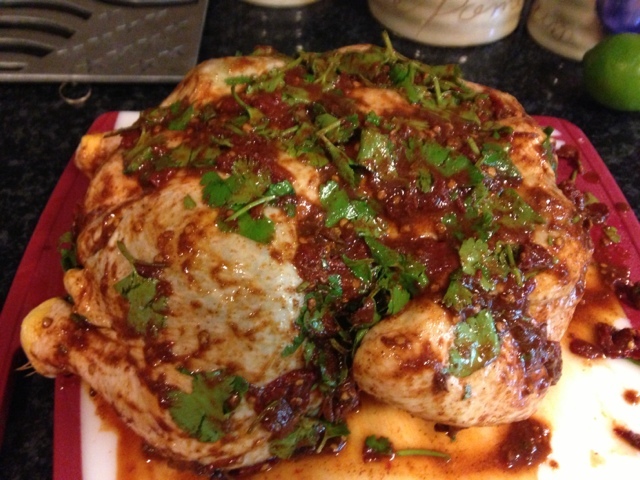 In the oven, cook the chicken for 25 minutes at 425 degrees and then another hour at 375 degrees. Cook on the grille until the internal temperature is 165 degrees. 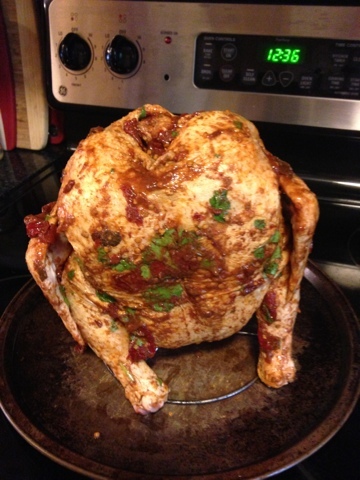 We stuck a beer can inside the chicken and do this too if you can! 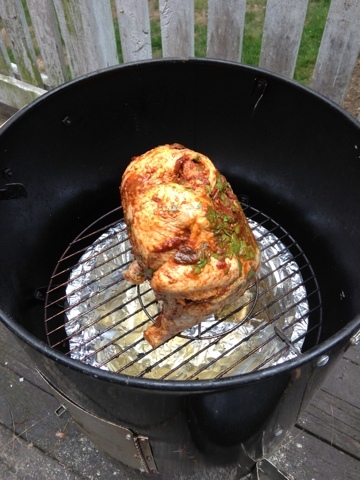 Stick on the smoker and smoke for about 2 hours or until the internal temperature is 165 degrees. Once you remove the chicken from the heat source, let it sit for about 10 minutes. This is always the hardest part for me. After the bird has rested, slice up and serve!!! We served our chicken with black beans and rice, pico de gallo and cheese! Yum! Ahhh cannot wait to try this! Made your enchiladas a few weeks ago and they were the best enchies I've ever eaten! oh wow! my mouth is watering!! !